During the Electronica Productronica China (EPC) event in Shanghai, that took place earlier in March—RS Components, the global leaders in manufacture and delivery of electrical components, as well as creators of the Raspberry Pi computer, approached software developer Makemedia to create a unique, and exciting interactive booth game to draw attention from the crowds and deliver an overall business message for RS Components. The talented development team over at Makemedia came up with the idea of new 4-player sci-fi racer experience, that networked with the Oculus Rift virtual reality headset. With keeping RS Components business in mind, Makemedia designed the sci-fi racer to take place in futuristic setting based on circuit boards and electrical components. The core concept of the track was designed to be like a heatsink cooling pipe tube, as racers blaze around components at high-speeds competing for the best lap time. 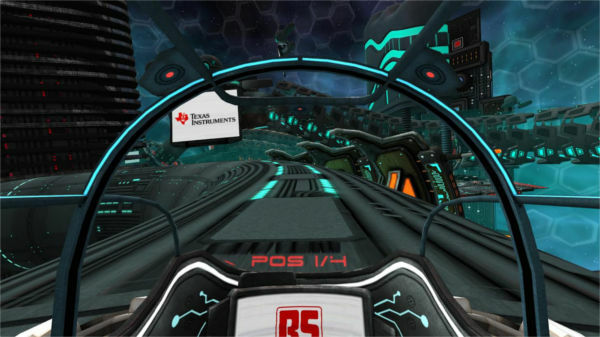 The gameplay is fast-paced, yet simple to play where players (booth attendees) sat in sparco rally driver chairs and wore Oculus Rift virtual reality headsets to fully immerse themselves in the cockpit of their very own racing ship. 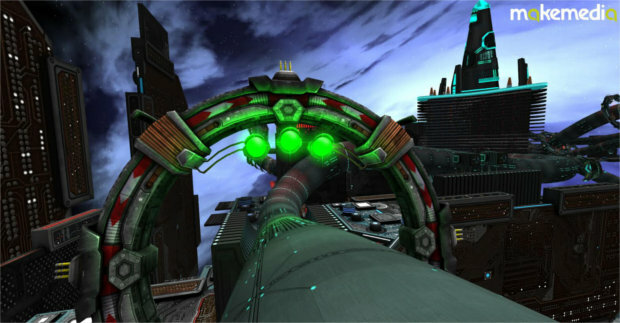 With the Oculus Rift, players could freely to look around the game world in full 360-degrees, looking into corners to aim for the next speed boost, or watch out for any slow-down gates rotating around the pipe to avoid. 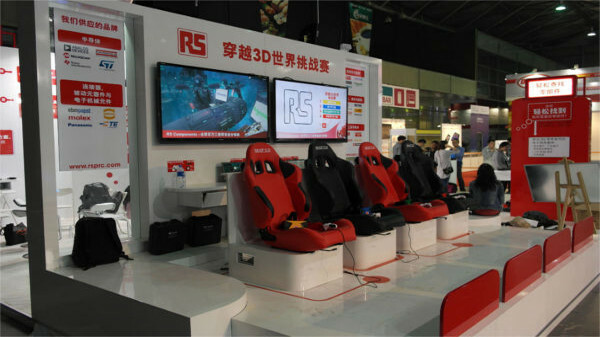 As a result of the unique VR experience delivered by Makemedia, the RS Components booth was a clear success as one of the most popular at the event. An estimated total of over 720 people had the chance to experience the sci-fi racer with the Oculus Rift, many for the first time. RS Components plan to bring the game and Oculus Rift VR experience to other trade shows in the West throughout 2014. Hopefully, with the availability of the DK2 headset anticipated in July, Makemedia’s sci-fi racer will deliver an “even more excellent experience for booth attendees at these shows,” with the game already running at a solid 1080p/60fps.